“In 1994 I was working in the physio department at Orsett Hospital. This is where I met Sandra who had Muscular Dystrophy. I had just finished my hydrotherapy course in Bath and I was treating her in the pool. She loved the water: it gave her a sense of freedom that her illness had taken away from her. On dry land she needed a wheelchair and other bits and pieces of equipment, but in the water she was free from all that and she regained a sense of independence and a way to do some exercise. 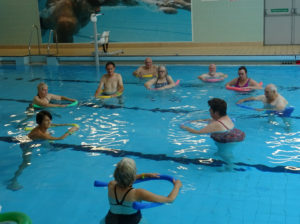 When her sessions were coming to an end she started thinking about the possibility of continuing exercise in water, maybe in one of the local pools. From one thing came another and after a lot of effort and fundraising from her side we were able to start. We had to find a name and we hesitated between Dolphins, Penguins, Waves, etc until my late partner David thought of “WADERS”: acronym for Water Assisted Disability Exercise (and) Rehabilitation Scheme. Very appropriate as we do a lot of wading. All big things start small and WADERS certainly started small! In December 1995, five of us met at Blackshots Leisure Centre: Sandra, her husband Sid and two friends whose arms she had twisted into coming along. We only used a corner of the teaching pool during a public session, competing with the noise of screaming children! Each participant paid £1. Gradually the numbers grew and we were able to take the plunge (pun intended!) and hire the pool just for our use. We added an evening session so that those working during the day could attend as well. Over the years numerous people have benefitted from coming to WADERS, some have come for a short while until their problem was sorted out, some come every so often for a few sessions and some come on an ongoing basis and are there every single session, come rain or shine.